Expanded and updated with 70 all new pages, Portable Press presents Uncle John's Bathroom Reader Shoots and Scores: Updated and Expanded Edition . Product Description - Now updated and expanded with 70 new pages, this collection of slap shots, penalty kills, and toothless grins offers fans everything they love about hockey: its colorful history, legendary players, and enough hard-hitting trivia to satisfy even the most avid stat head. The latest title in Uncle John's series dedicated to the wide (and weird!) 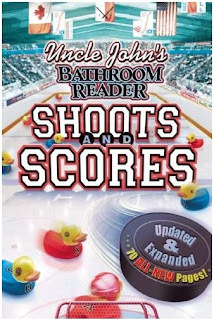 world of sports, Uncle John's Bathroom Reader Shoots and Scores: Updated & Expanded Edition shares the origins of the "Coolest Game on Earth," the greatest teams in hockey history, the best (and worst) hockey movies of all time, the Incredible Exploding Zamboni, a rap sheet of hockey arrests, goalies' superstitions (Patrick Roy's conversations with goal posts, Glenn Hall's pre-game upchucking), and much, much more. About the Author - The Bathroom Readers' Institute is a tight-knit group of loyal and skilled writers, researchers, and editors who have been working as a team for years. The BRI understands the habits of a very special market--Throne Sitters--and devotes itself to providing amazing facts and conversation pieces. Uncle John's books are incredibly popular. Amazon has over 550 Uncle John's books listed.